Are you planning to move to Lahore and don’t know which area would be suitable for you and your family to dwell in? Or are you already living in Lahore and want to shift to a new place but are stuck in the Bahria Town vs DHA Lahore debate? Whatever the case may be, one should never take these decisions lightly. Instead, you should do extensive research on the facilities available in each area along with their rental and buying trends. You can’t invest in Lahore, or elsewhere for that matter, without doing an in-depth analysis and properly weighing your options. According to the buying trends of properties in Lahore, out of hundreds of other projects in the city, DHA Lahore and Bahria Town Lahore are two of the most sought after areas for renting and buying property. The reason behind their popularity is pretty simple: both of these areas have a wide variety of housing options up for sale, modern infrastructure and top-notch amenities in a safe and secure environment. 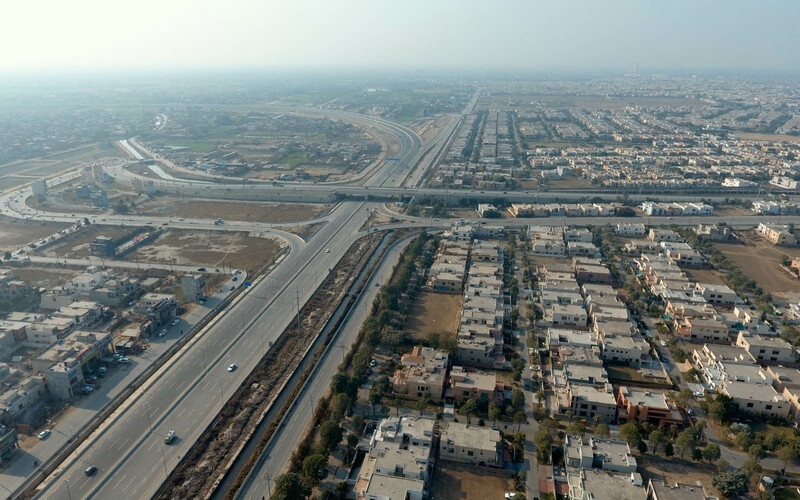 If you are confused between the two areas and are wondering which one might be more suitable to live or invest in, here is a Bahria Town vs DHA Lahore comparison that might make things a little easier for you. Defence Housing Authority is regarded as one of the most upscale and well-planned housing societies in Lahore. The governing and executive boards of the society comprise retired army officials as the project was originally established for retired servicemen, but was later opened for civilians. So far, DHA Defence has 11 phases, out of which Phases 1 to 5 are developed and populated while properties in Phase 6, Phase 7 and Phase 8 are available for possession. The rest of the phases are currently being developed. Within Defence Lahore, Phase 6, Phase 7 and Phase 8 appear more popular than the rest when it comes to buying property. Meanwhile, Phase 5 and Phase 3 along with Phase 6 are the most searched phases among those looking to rent houses and flats in the area. Bahria Town is undoubtedly one of the most popular housing projects in Pakistan, famous for both its affordable housing options and state-of-the-art facilities promising a modern lifestyle. Launched in the mid-2000s, this gated community offers residents all essential amenities within its boundary walls. The society, which has become somewhat of a major tourist attraction in Lahore, also has its very own security team. This is perhaps one of the most important points in the Bahria Town vs DHA Lahore debate. Defence Lahore is known for its prime location in the heart of the city as it is situated near Lahore Cantt and Gulberg, two of the major residential and commercial areas in Lahore. For those living in DHA Lahore, it takes about 15 minutes to get to Allama Iqbal International Airport in Cantt from the area by a car in normal traffic. Morevoer, it is a 23-minute drive away from Lahore Cantonment Railway Station. Meanwhile, people living in Bahria Town don’t have to travel too far either. The mega real estate project, which is more or less a city in itself, is located on Main Canal Bank Road at a distance of about 17 km from the town of Thokar Niaz Baig. It is an approximately 45-minute drive away from the airport whereas it takes about 47 minutes to get to the railway station from here. Both DHA Lahore and Bahria Town are easily accessible from almost all other areas of Lahore as well. For those planning to buy real estate in these areas, here is a detailed analysis of Bahria Town vs DHA Lahore property trends. Property for sale in DHA sale includes houses, apartments and plots. The average price of real estate in DHA Lahore, particularly houses, is slightly steeper compared to Bahria Town. For instance, a 5 marla house in DHA Defence costs between PKR 100 lakh and PKR 2.7 Crore, while the price of a 10 Marla house can vary from PKR 1.90 crore to PKR 3.25 crore. Similarly, the buying trend of 1 kanal houses ranges between PKR : 3 crore and PKR : 6 crore. On the other hand, if you are looking to buy an apartment in Lahore that offers modern amenities, Defence Housing Authority also offers 2 and 3-bedroom flats for sale. The price of 1 2-bedroom flat costs around PKR 90 lakh to PKR 3.5 crore while the price of 3-bed apartments in Defence Lahore starts from PKR 1 crore and can go up to PKR 3.8 crore. The cost of residential plots in DHA Lahore is between PKR 35 lakh and PKR 1.25 crore for 5 marla while investors can buy 10 marla plots within the range of PKR 60 lakh to PKR 2.25 crore. The price for 1 kanal plots can be a bit steep as it varies from PKR 80 lakh to PKR 4.25 crore. It is important to note these prices may vary depending on each project and locality. Property for sale in Bahria Town is slightly more affordable than in Defence Lahore. If you are considering buying a house in Bahria Town, a 5 marla option costs between PKR 70 lakh and PKR 1.6 crore while the price of 10 marla houses is around PKR 98 lakh to PKR 3 crore. Meanwhile, the asking price of 1 kanal houses ranges between PKR 1.4 crore and PKR 5.7 crore. Since studio apartments are perfect for individuals and couples, you can purchase a studio in the area within the range of PKR 40 lakh and PKR 62 lakh, while the price of 1-bedroom flats varies from PKR 24 lakh to PKR 65 lakh. For those who have a bigger family and require more space, a 2-bedroom apartment in Bahria Town Lahore will cost between PKR 45 lakh and PKR 1.1 crore. As for the residential plots available for sale in Bahria Town Lahore, investors can purchase 5 marla plots between PKR 22 lakh and PKR 1.1 crore while 10 marla plots can be bought for PKR 27 lakh to PKR 2.4 crore. Similarly, the buying trend for plots of 1 kanal area size starts from PKR 65 lakh and goes up to PKR 2.8 crore. As mentioned above, the buying trends in Bahria Town are bound to differ with each sector and block. If you are only planning to rent out property in either of the areas, here are the Bahria Town vs DHA Lahore real estate rental trends. The rental trends of real estate in DHA Lahore vary with the size of the houses. You can rent a 5 marla house for the price of PKR 50 thousand to PKR 60 thousand per month while the rent for a 10 marla house ranges between PKR 85 thousand and PKR 1.25 lakh on an average. Meanwhile, the rental price of 1 kanal houses starts at PKR 90 thousand and can go up to PKR 2 lakh depending on the locality. As for renting flats in DHA Defence, you can rent a 2-bedroom apartment in the area within the range of PKR 35 thousand and PKR 55 thousand. Of course, fully or semi-furnished flats are bound to be more expensive. The rental trends in Bahria Town, comparatively, are a bit more affordable. The rent for 5 marla houses in the locality will cost between PKR 20 thousand and PKR 80 thousand per month while a 10 marla house can be rented within the range of PKR 35 thousand to PKR 1.5 lakh. For those looking to rent out apartments in Bahria Town Lahore, the monthly rental cost of 1-bedroom flat varies between PKR 14 thousand and PKR 50 thousand whereas the rent for 2-bedroom apartments ranges from PKR 22 thousand to PKR 60 thousand or more. You can’t complete a Bahria Town vs DHA Lahore comparison without discussing the amenities and facilities available in each area. Life in DHA Lahore has its own charms. There are multiple bus stops across the area, providing residents of Defence Lahore easy access to public transportation. The housing society is also working to set up its own grid stations for electricity back up. Out of the proposed 21 grid stations, six are currently in progress, four are awaiting approval and one is already active. Moreover, you can easily find campuses of all famous schools in the area, including The City School, Defence Public School and Scarsdale International School. Similarly, major colleges and universities in the area include DHA Degree College for Boys, Defence Degree College for Women and TAC School System Lahore along with Lahore University of Management Sciences (LUMS) and Lahore Garrison University. As far as clinics and hospitals are concerned, Pakistan Kidney And Liver Institute and Research Centre, National Hospital and Medical Centre and DHA Medical Centre & Dialysis Centre among other healthcare institutes are also located in Defence. Living in DHA Lahore does come with a lot of perks. For instance, you can find branches of all major banks, mosques, parks, restaurants, cafes, supermarkets and outlets of local and international brands quite easily in almost every block. There are also several spas, beauty and fitness centres along with recreation and sports clubs in the area offering their membership holders different facilities such as gym, swimming pool and library. Lahore’s first tattoo parlour is also located in DHA Y-block. For those living in Bahria Town Lahore, transportation is not much of an issue, as along with rickshaws people also have access to Lahore Transport Company (LTC) buses, which leave the gated community every half an hour starting from 6 am to 10:30 pm. You can also book a cab through one of the many ride-hailing services operating in the city. There is also no shortage of supermarkets, grocery stores and other retail outlets, which makes residents’ life in Bahria Town much easier. From high-end international brands to local stores, you can find pretty much everything here without having to exit the main gate. There are a number of mosques in Bahria Town, including Grand Jamia Masjid, which is one of the most beautiful and largest mosques in Pakistan. Since Bahria Town Lahore has its own grid station and transmission lines, residents don’t have to suffer load-shedding and frequent power breakdowns. It has also become one of the main reasons why investors are drawn to this project. Furthermore, they have also set up their own preschool, school and college within the society to provide young residents with the education of international standards. The major hospitals in the area include Bahria International Hospital, Life Care Hospital and Bahria International Hospital Orchard. Bahria Town Lahore also has its own security system with trained guards and modern patrol cars. Branches of all major banks are also available in the area along with state-of-the-art fitness centres, spas and salons, recreation and sports clubs, children’s play areas, amusement park and a wide variety of cafes and restaurants catering to all palates. There are also at least six shopping malls within the society, including Safari Mall and Jasmine Mall. 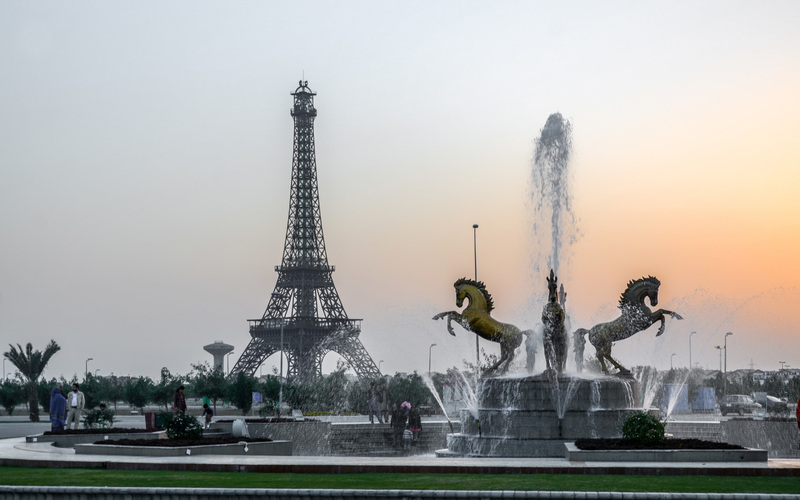 The replica of the Eiffel Tower in Bahria Town has also become a popular tourist spot in Lahore, with visitors posing for photographs in front of the structure. So, which area would you prefer to buy or rent a house in?